West Seattle artist Kate Fluckinger looks for beauty in change, aging, and the darker, more emotional sides of life. Although not always intentional, her work often portrays relationships or the lack thereof. She hopes the viewer will consider questions of what is hidden or how it feels underneath. 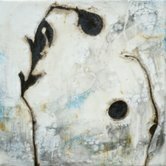 Kate works primarily in oil paints and beeswax (encaustics), sometimes with clay or silver. View more of her work at http://www.katefluckinger.com/.